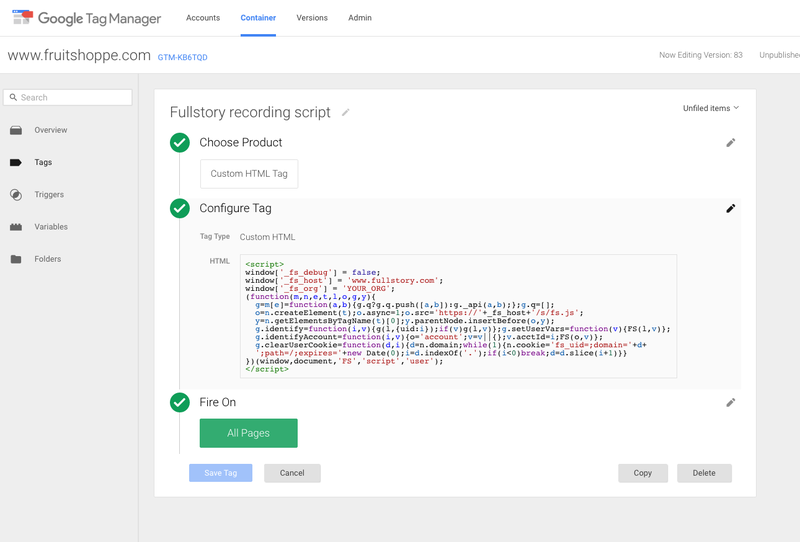 FullStory's integration with Google Tag Manager allows you to install and enable FullStory on your website or app with the click of a button. 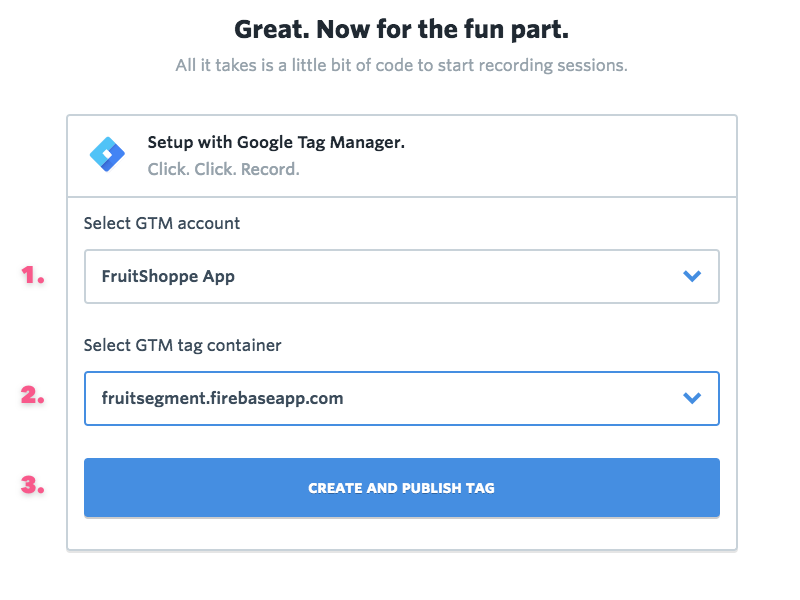 If you're not familiar with Google Tag Manager, find out more on the GTM website. 1. Set up directly within FullStory (only available on your first log in). 2. Set up at any time within Google Tag Manager. When you log in to FullStory for the first time we check if your domain (based on your login email) is using Google Tag Manager and give you the option to install with a few clicks. Note: This option is only available once. Please scroll down to the Option 2 section if you skipped the GTM installation setup flow on your first login. 1. Log in to FullStory and complete the first two steps of your on-boarding process. 2. If your site uses Google Tag Manager click Setup with Google Tag Manager during your on-boarding process. Note: you'll need to enable pop-ups to display Google Tag Manager auth dialog. 3. Select the GTM account and then the tag container you'd like to use. Then click Create and Publish Tag. 4. 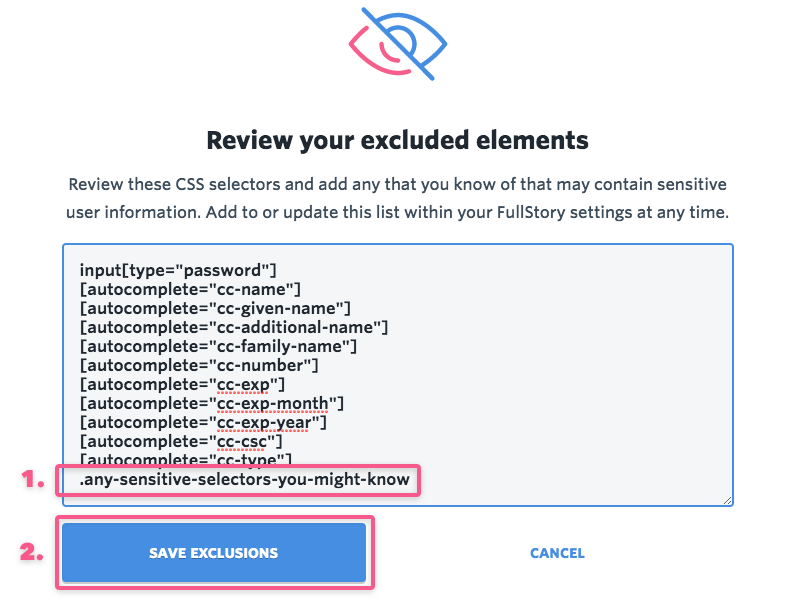 Consider adding Excluded Elements to prevent FullStory from capturing sensitive user data. Click Review your Excluded Elements. Add selectors and click Save Exclusions. 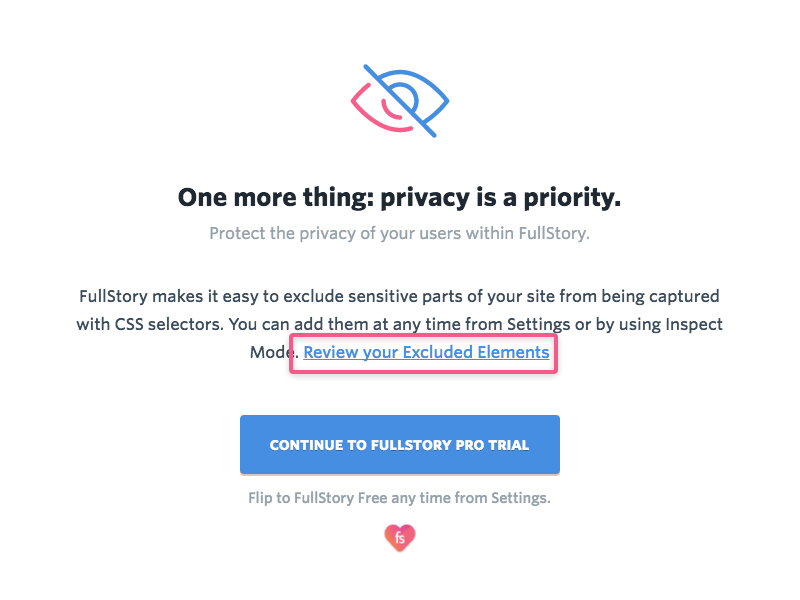 Note: you can update these at any time by going to Settings > Recording & Exclusions within FullStory. 5. 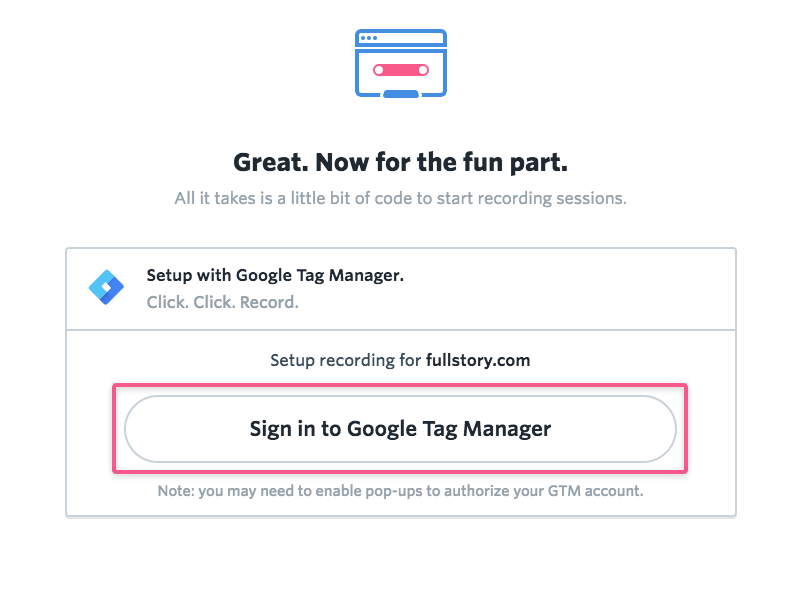 Start your trial and start recording your pages with Google Tag Manager and FullStory! 1. Log in to Google Tag Manager. 2. Inside the container that is connected to your website, select the "Custom HTML Tag" tag type option to place 3rd party scripts into the container. 3. Paste the FullStory code snippet (found in FullStory under Settings > Domains & Recordings) into the HTML text box. 4. Define when the rule will "fire" by clicking on Firing Rules [+Add] button and change the rule as needed. 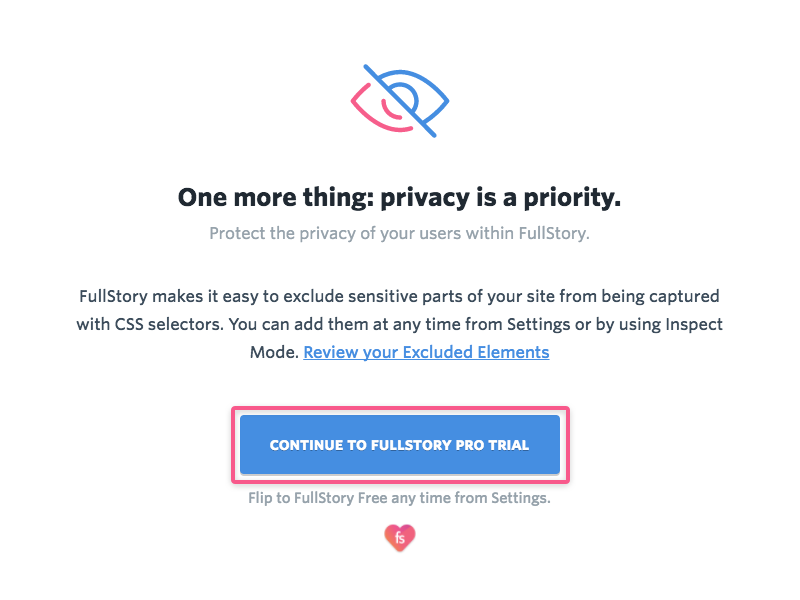 By default, FullStory should fire on all pages so there are no pages or events that are accidentally omitted from user sessions.